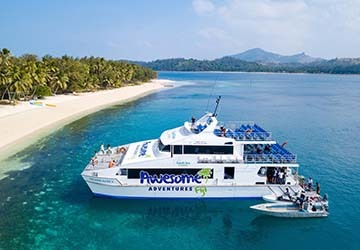 The Awesome Adventures Fiji transfer service utilises the well-known catamaran, the Yasawa Flyer, the most popular vessel for tourists to get to and from the Yasawa Islands. She departs the passenger terminal at Denarau at 8:30 every morning to begin the island hop between the tiny Mamanuca Island resorts before heading to the paradisiacal Yasawa Islands, stopping off along the way to pick up and drop off tourists. The last stop is the famous Blue Lagoon beach resort in the north, before the Yasawa Flyer heads back south, stopping off at each islands once more before getting back to the marina at Denarau around 17:45. On board Yasawa Flyer you’ll find air conditioned seating, a travel desk, licensed bar, café and outdoor viewing decks. For a small supplement, on some routes you can upgrade to the Captain's Lounge on the upper deck. The lounge has large wrap-around windows, comfortable couches and features complimentary drinks and snacks. Awesome Adventures Fiji occasionally use ships owned by their sister company, South Sea Cruises which are also fast, modern vessels and purpose built for travel around the Fiji Islands. For those staying on the mainland, there is a daily free coach transfer to the passenger terminal at Denarau available from Nadi, Wailoaloa and Denarau hotels and accommodation. This service is available on request. Directferries.co.uk allows you to compare Awesome Adventures Fiji timetables and fares with all alternative ferry operators before deciding on the best option for your trip.